This year’s Scholars Week keynote speaker was Bill Ivey, distinguished scholar and author, on March 28. 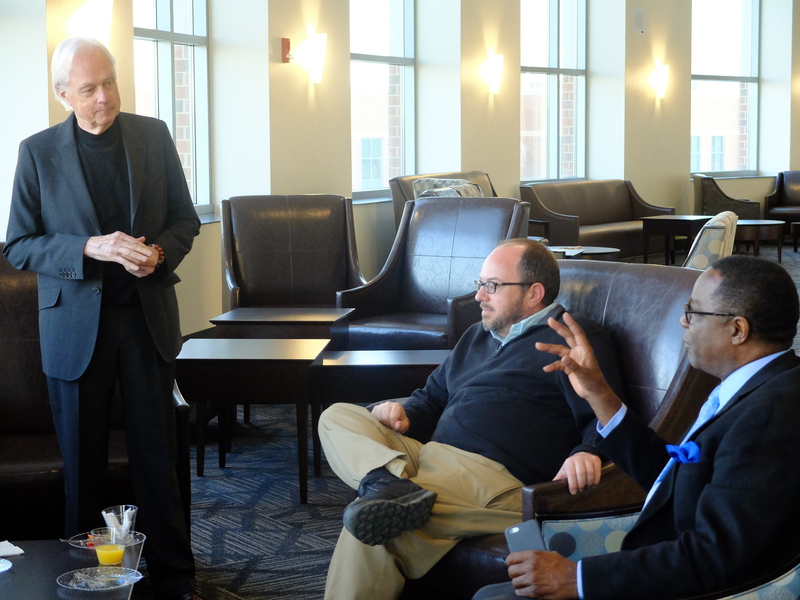 Keynote speaker Bill Ivey, left, and Professor and Scholars Week committee member Will Langston listen as MTSU President Sidney A. McPhee makes a comment during their casual conversation March 28. Ivey spoke to a number of students, faculty and administrators in the Student Union Ballroom regarding creativity, career and public education. He specifically drew attention to administration, education and cultural public policy and how Americans live in an era when business, technology, economics and education are increasingly intertwined. He challenged those in the audience to define how the balance of understanding between artistic expression, creativity and scholarship impacts education and the individual’s quality of life. Academic Affairs hosted a reception for Ivey preceding the lecture. Scholars Week emphasizes the research, scholarly efforts and collaboration of undergraduate and graduate students and faculty. This year’s keynote address was sponsored by the Distinguished Lecture Fund, Department of Recording Industry and College of Media and Entertainment.